What if we could compile a list of shooting tips from 10 of the top shooters in the country? Would you give it a read? Would you share it with all of your friends? Well, we know a lot of people from around the shooting sports/self-defense industry, and have done just that. Here are some tips from folks you know, as well as some who you may not know but are some of the best instructors this country has to offer. Here is the audio podcast presentation of these tips! You can also read them below on this page. Hi, this is Annette Evans, The Beauty Behind The Blast with Race Street Range. I'd like to share a tip with concealed carriers that will really improve their every day shooting, every day life. And that is to, every time you put on your gun in the morning, every time you put on your gun before you go out, spend two minutes taking the time to just clear your cover garment and get a full firing grip on your handgun. Do that at least 10 times before every time you go out, and that's going to improve your draw if you have to use your gun. I hope that helps you. 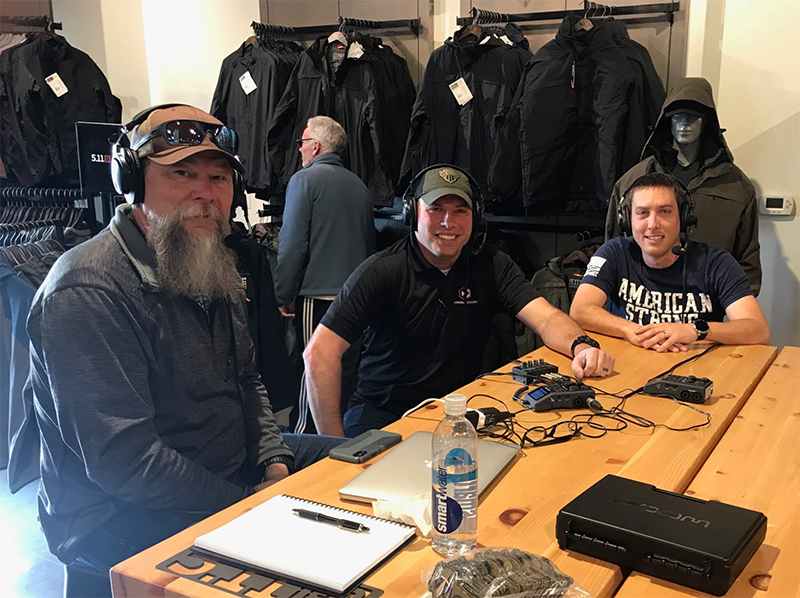 Thank you, Riley and the team at ConcealedCarry.com for letting me join the fun. Hi, it's Chris Cheng, History Channel's Top Shot Season Four Champion and author of the bestselling book for new shooters called Shoot to Win. I'd like to share one great tip on trigger control that will help you improve your shooting. Good trigger control helps ensure that the sights don't move as you pull the trigger. So here's the tip: Fully unload your pistol and make sure all ammunition is in a separate room or area. Once you've confirmed that your chamber is empty, place a penny flat on top of your front sight and bring the gun up to eye level. Pull the trigger all the way back until you break the shot, and do it so the penny stays on the front sight the entire time. Reset and do it again and again until you consistently succeed. Once you're ready, load up with ammo and see how much more accurate you'll be. I covered this tip and many more in my book, Shoot to Win, the book for the new shooter. This is Chris Cheng, and I hope you enjoyed this tip. Thank you Riley, and the team at ConcealedCarry.com. Hey concealed carriers, this is Eric Frohardt, director of education and training for the NRA. There are many different things we can do to become better shooters, and if I had to choose only one tip, it would be this: Focus on the basics. Too often, people try to move on to more advanced drills before having ingrained the basics. Working on the basics may seem boring at first, but the progress, in the end, will more than makeup for it. Remember, the best do the basics better. Thank you Riley, Jacob, and the team at ConcealedCarry.com. This is Eve Flanigan, an instructor in the Great American Southwest. The tip I would like to share today is the power of focusing on the front sight. Assuming that your rear sight, your front sight, and your target are all aligned, focusing your eye on the front sight, is actually the technique that took me from being a decent shooter, to be a really good shooter. I guarantee it'll cut the size of your groups in half. While this may be the most counter-intuitive thing you ever learn, in terms of the shooting fundamentals, it really does work. I'd like to give a big thanks to Jacob Riley, and the team at concealedcarry.com. Hi I'm Jeff Gonzales President of Trident Concepts. Today I'd like to share a pro tip for improving your shooting from concealed carry. From an educational standpoint, we want to work from the simple to the complex. This means, not just starting with the simple things, but making them as simple as possible. This is helping in two ways. First, it establishes a solid base. And second, it helps to isolate your weak areas. Everything we do down to the smallest detail must be performed to a minimum performance standard. It does you no good to advance to something else if you haven't met the standard. It's like putting too much weight on a barbell thinking you can make the lift. You either miss the lift, or you injure yourself due to bad form or technique. Now to help improve these micro-tasks, I suggest performing them at slow speed. Slow speed is excruciatingly slow. But incredibly valuable. By moving at this speed, what you're doing is thinking your way through the technique. Thereby allowing the best conditions for success. You literally think through each of these micro-tasks that make up the larger tasks. But at a speed that ensures you're able to perform them to the standard. As you perform the task over and over, your ability to perform at a high level of precision becomes more natural. Setting the stage for increased speed, which is the next level, which is a whole other subject. I'm Jeff Gonzales and until then, train hard and stay safe. This is John with Active Self Protection. One tip that I'd like to share with concealed carriers that will improve their shooting is to actually do the work. You will not get better unless you actually do the work. Now, what does the work look like? Well, once you've taken a couple of classes and you know the things that make for good defensive shooting, that means you need to do your dry fire three days a week, 10 minutes each time, at least. If you don't do that level of work, you won't get better. So make sure you follow all your safety protocols and do safe and effective dry fire work three times a week. Do that for several months and get to the range at least once a month to verify that your dry fire work is helping you in your live fire. If you do the work, you will improve as a defensive shooter. Thanks to Riley and the team at concealedcarry.com. Hi, this is John from Shooter Technology Group. One tip that I'd like to share with concealed carriers that will improve their shooting is, really, I just encourage you to change it up. A lot of people just go to the same indoor range and shoot the same target from a static position. You need to change up your practice. You need to do more challenging targets, more challenging situations. Wear different clothing, try different shooting positions. Try shooting around cover, things like that. All these things you do need to do some research on to make sure that you're practicing them properly and, most importantly, safely. There's plenty of the different reference materials out there available for that but, again, if you're not out there challenging yourself and pushing yourself to do better, then you're not really gonna grow as a shooter and that's kind of what we're all about, aren't we? Thank you, Riley, and the team at concealedcarry.com for the chance to give you all these tips. Hello, this is is Klint Macro, founder of the Trigger Pressers Union. One tip that I'd like to share today to help concealed carriers improve their shooting is to make sure that your gun, your carry gun, fits your hand, especially in regards to grip angle. An easy way to check this, to get a perfect two-handed thumbs forward grip in a high compress ready position, close your eyes and drive the gun to full extension. Make sure both arms are at full extension. Open your eyes, and see if the sights are level. By closing your eyes, you're depriving your brain of visual input, and you're allowing your body to point the gun naturally. If you do this exercise, and the front sight is higher or lower than the rear sight, then the grip angle doesn't fit you. I don't recommend carrying a gun that doesn't fit your hand. If your gun has interchangeable backstraps, then swapping them out might fix the problem, but your gun, especially your particular tool of self-defense, must point where you are looking. It must point naturally, or kinesthetically. You can check this easily at the gun shop. Just don't point the gun at the clerk or the other customers when you try it. If the grip angle fits your hand when you extend the gun parallel and into your line of sight, you will find it much easier to maintain a level of accuracy without using your sights. That's if you're focused on the target, or find it more efficient to achieve precision when you do use your sights. In a defensive application, we need to be able to use our tools with the least amount of cognitive processes possible. Save that brain processing power for target identification, recognition of what's around our target, avoidance, and even escape. It is important to be confident with your own level of competency in using unsighted and sighted fire both, and recognize when you need to use your sights, or not. Having a gun that fits and has the correct grip angle for you will help you with this. Stay safe, be well-regulated with your defensive tools, and be a good ambassador for the safe and responsible use of firearms. This is Kyle Lamb from Viking Tactics, and I guess my one tip I would give you concealed carry shooters out there is, it's actually kind of a two part'r, I guess. First of all, train with the firearm that you actually carry for concealed carry. I know that's one of the things I get caught up in. I've got my range rig, and then I've got my concealed carry rig. I always notice deficiencies when I get out there and train with my concealed carry rig. So, always, always, always do that. Train with the gear you're gonna carry and use a pro timer if possible. That way you'll actually kind of know what you're up against, what the time standard is, where you wanna be, where you're actually at, and it's the teller of truth, that little beeping box. Keep listening to Riley and the team over there at concealedcarry.com, and once again, this is Kyle Lamb from Viking Tactics, and man, get on the range and take your kids shooting. Hey guys and gals. This is Mike Seeklander with Shooting-Performance.com, as well as the americanwarriorsociety.com. And I have been asked to give you a shooting tip. One of the tips that I'd like to share with concealed carriers across the US and world is one simple thing that will make you a dramatically better shooter with the handgun, at least that is. And that is, gripping the handgun harder than you think you should. I know a lot of people talk about relaxing your grip, or a firm grip, or gripping it as hard as you would grip a hammer. And those, to an extent, may all explain how hard you should grip a handgun. But, the bottom line is, across the board, with just about every single student I've ever trained, I've found that if I stand next to them, and tell them “All right, fire a couple of shots. You feel comfortable? Okay. Watch the front site recover during recoil. Now, I want you to take both of your hands, put them on the handgun properly, and grip the handgun really hard. Now fire two shots.” And they see a distinct difference in their ability to recover the handgun during recoil. Hey, folks, thank you to Riley and the team at concealedcarry.com for asking me to submit this tip. I hope this helps you out. And just remember, grip the gun hard. Thanks folks. Mike Seeklander out. That about does it, friends. Make sure you share these tips with everyone you know. Stay safe, train often, and remain alert. 1776 Glock Pistol Winner Announced!